Traveling: Space travel is pretty easy, you must have two things. A space ship of any sort is one of them, and the other is around 7 days. Typically it takes 1 week to travel to or from any planet. Which type of ship you have may decrease this time. Description: Drangleic is best described as a virtual utopia of a planet, thriving with all manner of life. The entire planet is almost completely devoid of technological advances save for some random spires located across the planet's surface. The geography of the planet is vast and as different from area to area as most planets with a 50/50 ratio of land to water. Each of the planet's polar caps houses a land mass of frozen tundra habitable only by species that have evolved to adapt to the locations. Volcanoes, mountains, deserts and valleys all cover the planet's surface. As do forests and canyons and islands. The uniqueness of Drangleic's geography is in its vast selection of otherworldly majestic environments such as it's lightning valleys, valleys formed between mountain ranges where lightning storms at constantly active at all times of the day. Or the acid pools located within pitch-black forests that produce potent natural poisons and acids. These locations are ideal habitats for the planet's primary occupants, dragons. The atmosphere, by result, is astoundingly rich in oxygen produced by the vast number of plants covering the planet's surface, making it easily breathable to most all species that would visit it. 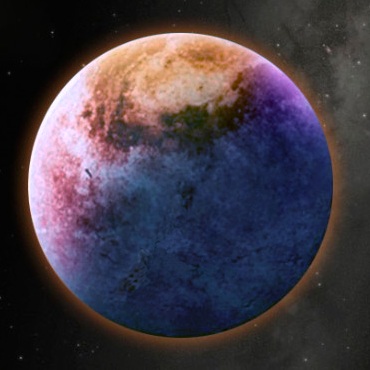 Description: A small sentient planet known as a planetary titan. The planet has one main continent made up of six countries: Judif, North Biscopo, South Biscopo, Malifore, Valir, and Querenci. The rest of the world is relatively unexplored, mostly because Grace herself does not want it to be, and so the oceans and atmosphere outside of this land are treacherous at best. The main continent has the best of many cultures: Judif for the battle hungry, Malifore for mercenaries out to make a quick buck, Valir for high crime, Biscopo for business, and Querenci as the melting pot for them all. If our gravity doesn't crush you, feel free to stay awhile!